Come and join our neighbors from up Peak Street for evenings of conversation and good cheer, around the theme of Christian hospitality in East Dallas. This Lenten study will review The Wisdom Jesusby Cynthia Bourgeault. She presents a perspective of Jesus as a "teacher of Wisdom"; his primary message being one of transformation, love, hospitality, and compassion to be experienced his followers' daily lives. The course will be experiential -- we'll talk about and explore the five Christian Wisdom Practices. Are you curious about the enneagram? Do you wonder which enneagram number matches your personality? Do you want to learn more about yourself and about this valuable spiritual tool? Then join us for five Sundays, 12:30 to 2:00 pm, beginning March 10. We’ll see videos by Suzanne Stabile, and read from her book, The Road Back to You. Suzanne is an author, teacher and well recognized enneagram master. Lennijo Henderson, who has studied and apprenticed with Suzanne for many years, will co-facilitate with Bonni King. In the first part of 2019 the Explorers class will be studying the second part of “The Challenge of Paul” course by Theologian John Dominic Crossan. The focus for this second part will be “Paul and Luke.” This course will take place on Sundays, January 20th - February 10th from 9:30am - 10:30am over at the Agape Clinic. The Chief Missional Strategy for the North Texas Conference is to reach New Faces in New Spaces. Join us for an honest discussion of the external and internal forces that challenge our ability to be effective witnesses in the 21st century, with an emphasis on the opportunities each of these challenges present as opposed to the difficulties. Learn strategies for promoting resiliency in pastors, staff members, lay leaders and congregations. Please join the Grace community and our neighbor churches, East Dallas Christian Church and St. Edward Catholic Church, for our annual Thanksgiving Worship and Dinner, Tuesday, November 20, 6:30 PM. We begin worship at Grace UMC, 4105 Junius Street; the St Edward Matachines Dancers will lead us across the street to East Dallas Christian, 629 N Peak Street, to continue our celebration; and we’ll end up at St Edward, 4014 Simpson Street, for supper. Celebration Sunday 2018--What Gifts Can We Bring? Join us in Grace’s Fellowship Hall for red beans and rice, cornbread and cake Sunday November 18th, immediately following worship. We will be celebrating the generosity of Grace Church the enables us to reach out, love all, and grow in Grace! Does God have a plan for my life? Does the Bible reveal what that plan is? Join us Sunday, November 4th, at 9:30, in Grace’s parlor to hear SMU/Perkins School of Theology Dean Craig Hill discuss his book In God’s Time: The Bible and the Future. Come to the State of Grace Fair! Howdy folks! This is Big Wes, John Wesley, inviting you to the State of Grace Fair on Sunday, October 28 from noon-2 PM in the Ol’ Time Parlor of Grace United Methodist Church, 4105 Haskell Street. See all the wonderful attractions of GUMC—Music, food, ministries, and nice people to meet; you can even get a flu shot, to avoid the croup! Get your spirit going! Remember the State of Grace Fair on Sunday, October 28! Be there! Just as the seasons change, so do our lives. Whatever season you find yourself in now, there will be an evolution to the next. Consider taking some time to learn new ways to experience deeper meaning in this time of life. We will use personal meditations and group interaction to better access the indwelling Spirit and become more of who God created us to be. Bonni Brophy King facilitates the process to support your inner journey. Contact BONNI B. KING 214-394-0619 bonnibking@gmail.com with any questions. On the first Sunday of each month, Pastor Judith Reedy hosts McMuffins (well, muffins, anyway!) at McCleskey Center, our ministries house at 4121 Junius Street, to welcome visitors to Grace United Methodist Church, Dallas, and to describe the many opportunities that come with membership in our busy, active, community. How do Grace members share our prayers, presence, gifts, service, and witness—all for building God’s Communion, here on earth? Please join us at 9:30 AM for lively conversation before our Sunday worship. Questions? please contact us at pastor@graceumcdallas.org, or 214 824-2533. It has become a tradition--serving lunch to Zaragoza Elementary School teachers during their week of training before school starts! Please be part of this generous ministry Thursday, August 9: Bring a salad, side, or dessert to share, then come serve hungry teachers at the school. It's always an event steeped in gratitude and great care for our community. For more information email Eric. Join Grace for an important discussion about who we are and how we use resources, inspired by Sallie McFague’s 2013 book, Blessed are the Consumers. Grace member Alice Montgomery will lead us as we consider our society’s relationship to the environment, and how the lives of several saints gone before us can provide lessons on stewardship, love of ourselves, and love of others. In this timely book, McFague recalls her readers to the practices of restraint. In a world bent on consumption it is imperative that people of religious faith realize the significant role they play in advocating for the earth, and a more humane life for all. Welcome to Peace Lab, where children discover God’s way of peace! From learning how to resolve conflicts to figuring out ways to help others, this interactive VBS curriculum helps children learn how to be peacemakers. The five Bible stories in this curriculum lead children on an awesome adventure through the Bible, equipping them to follow Jesus as compassionate peacemakers. 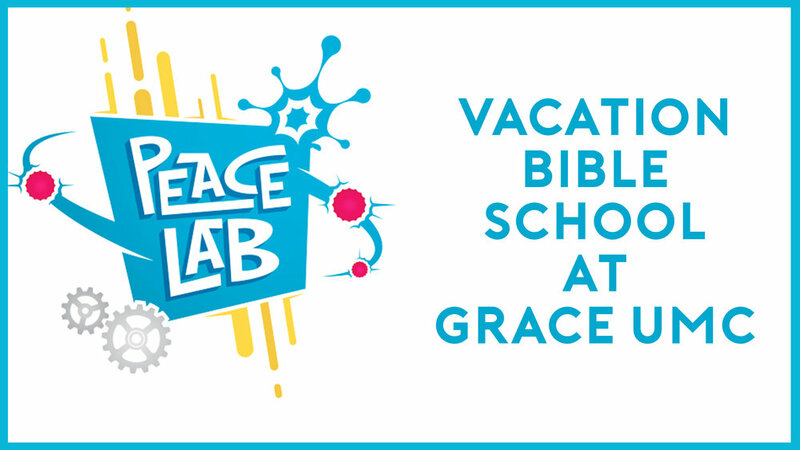 Vacation Bible School at Grace + East Dallas Christian Church is on Monday, June 25 for grades Pre-k to 6th during the summer. Children participate in a week-long camp with arts and crafts, science discovery, music, missions, and bible storytelling. Project Transformation mission is "to engage young adults in purposeful leadership and ministry, support children in holistic development, and connect churches with communities." Grace United Methodist Church is a host site for Project Transformation's Summer and After-school Programs. The final day to register for Summer and After-school programs is May 11th. The summer program is $20 per student or $50 per family. Children and Youth Grades 1-12 gather at Grace United Methodist Church beginning June 6 for 8 weeks, Mondays-Thursdays, 9:00 AM-3:00 PM. For more information, email Eric.